This summer we decided to take our holiday at home in the UK. 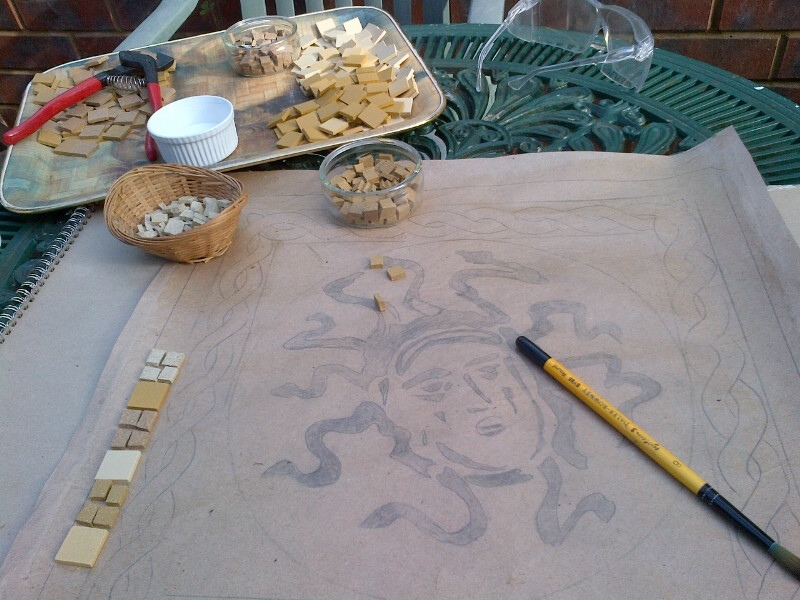 I was convinced that what I wanted to do most of all was to make mosaic on my patio at home in the sun. There I can quietly snip away with tile nippers and not worry about debris and dust on the floor. There was only one problem; UK weather! We should have gone to France. In the end we took a short break on the Isle of Wight where some better weather can often be found. I started Medusa in June. Now what, you might wonder, is my fixation with a goddess with snakes coming out of her hair and responsible principally for turning people to stone? You might well ask! 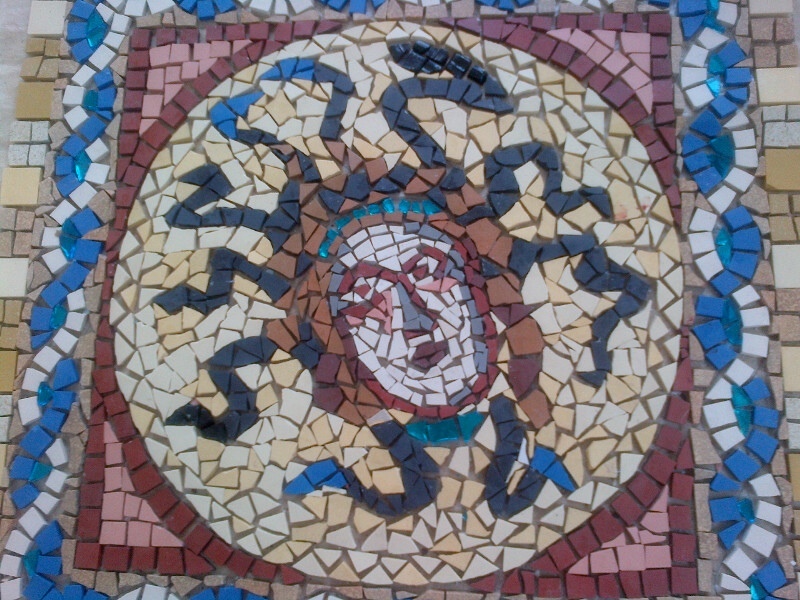 A simple answer is that there has come to be a snake theme in my mosaic work. They are, frankly, surprisingly easy to do in mosaic and look very effective. A more complex answer is that she has somehow come to mean something to me about the journey with the self. Having had multiple sclerosis for more than 26 years I’ve been on quite a journey and at times have certainly felt like I had snakes coming out of my hair! But as it came to be for the Romans, so for me, she has become something of a reverse good luck symbol. I also fell in love with the original at Brading Roman Villa on one of our many previous family holidays on the Isle of Wight. Not able to own the original, I decided to make my own Medusa. 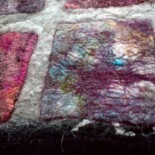 Anyway, here are some photos of the beautiful beaches on, and views from, the island and some pictures of my mosaic as it took shape through the summer. For those of you interested in doing your own mosaic work I will shortly be posting some more detail within the fixed sections of this site. Here’s one of my favourite beaches on the island. 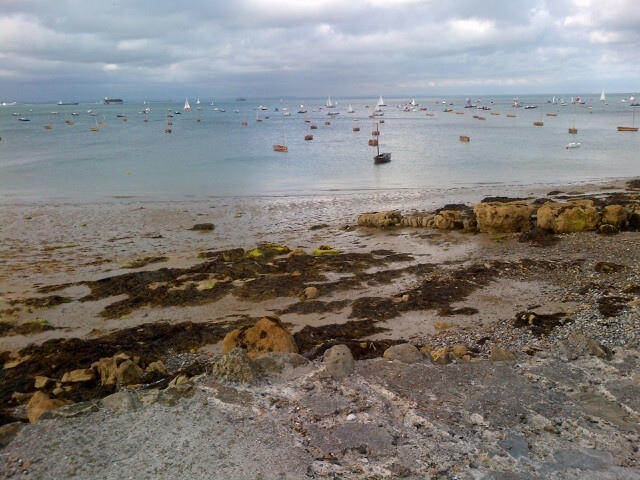 I love the views over to Portsmouth or watching the ships heading for France. 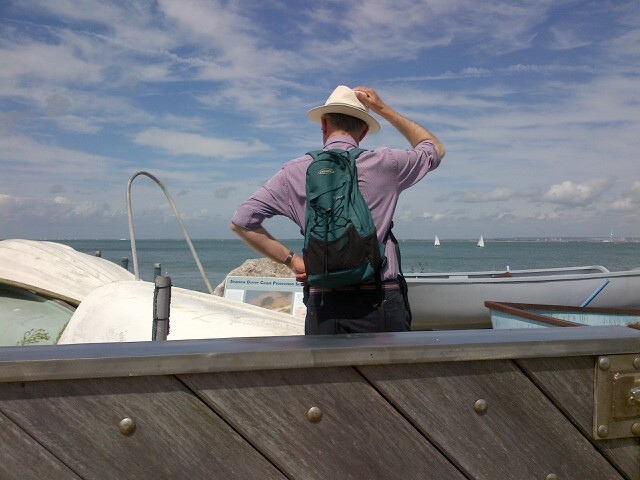 And this is my husband contemplating the boats and coastal information about ships passing by. This beautiful beach is renowned for crabbing. 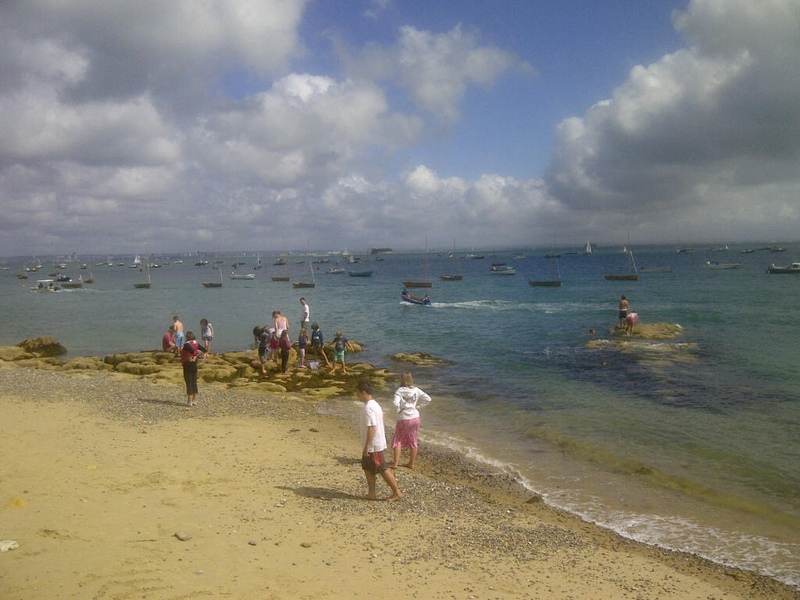 There is always a bevy of children on the rocks and the local shop sells more bacon for crab lines than breakfasts! Back at home and with some better August weather Medusa gets her finishing touches. I just need a fine September weekend to grout her. 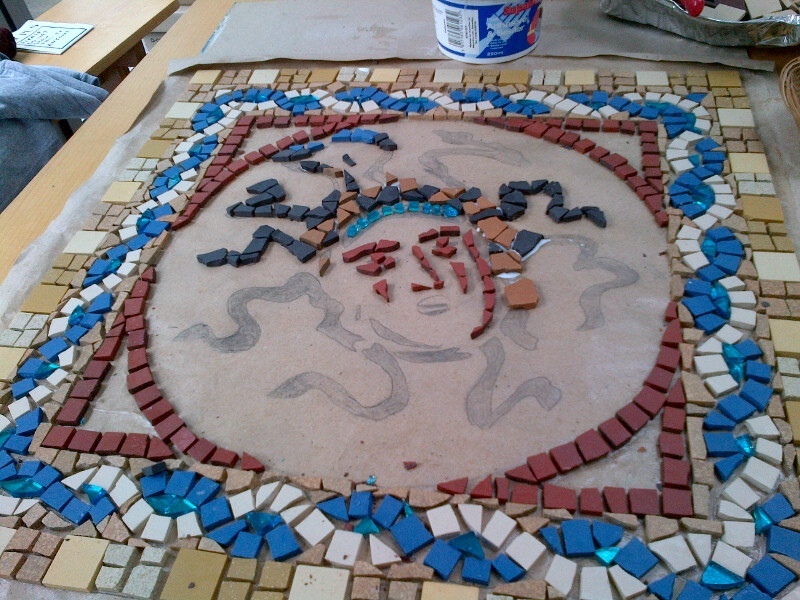 This entry was posted on 31/08/2012 by Themidlandperfumer in craft, crafts and crafting, creative process, mosaic, roman mosaic and tagged craft, goddess, Isle of Wight, mosaic, roman, UK holidays.